Cape Town - The Premier Soccer League (PSL) on Tuesday set a date for deliberation regarding a sanction on the matter of Mamelodi Sundowns being found guilty of fielding an ineligible player. 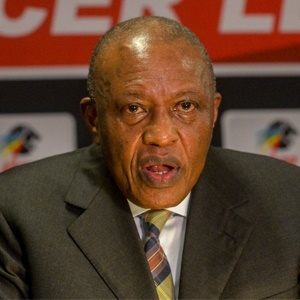 PSL chairperson Irvin Khoza had called an urgent press conference to address the media alongside PSL Prosecutor Nande Becker, PSL Head of Legal Division Michael Murphy and acting PSL CEO Mato Madlala. Khoza announced that the date set for deliberation on the Sundowns/Wayne Arendse matter is Friday, April 12. The PSL Disciplinary Committee last Wednesday found both the club and the player guilty of misconduct. This comes after Masandawana fielded Arendse - while ineligible - to play in the Absa Premiership fixture against Bidvest Wits on October 7, 2018. Sundowns are now likely to face a points deduction - which could impact the Absa Premiership title race - with Becker pointing to previous sanctions involving similar incidents. "I have a record of every matter I've dealt with where an ineligible player has been fielded. The standard sanction in all of those cases was you lost the match (points deduction), you paid money (a fine) and the player is going to sit on the bench for a while (player suspension). "If you won the match, you're going to lose the match by a score-line of 3-0 and pay a fine. This is what has historically happened in this league since I've been here." Madlala added: "Points deductions are a norm in football, so it's not like it will be the first or the last time that it happens. "Not that I'm judging this specific case at all. But if a points deduction is handed down we can't say it will bring the league into disrepute, rules are rules." Murphy revealed that a team can be investigated for misconduct independently, even if their opponents do not lodge an official protest. "I'm aware of the fact that Wits didn't protest against Sundowns," Becker added. "That's why the football department brought the matter to me and I decided to prosecute, in my capacity. Becker went on to detail the reasons for the delay in the process of investigating the matter, pointing to administrative issues and a high workload. "I have finalised 50 matters this season, four of those I have declined to prosecute," Becker said. "There are four appeals, nine charge-sheets issued already and six matters outstanding. I'm dealing with all these matters alone, that's the work volume. "In the matter of Wayne Arendse that has been widely spoken about, it's important to note I had no DC chairperson available from December 11 - January 15. The rules say there must be a chairperson. "Sentencing is now set for Friday, April 12," Becker concluded.